The Shanghai Composite gained another 2.4% on Monday adding to strong gains at the end of last week. The Chinese authorities appear to have put a floor under the brutal correction that took the index down thirty percent since the levels of mid-June. At least for the time being that is. Chinese authorities lifted suspensions that it had placed on around 400 companies. This allowed shares to trade again and brought liquidity back to the market. Positive news also came as data showed that Chinese imports fell far less than had been feared. Imports to June dropped 6.1% rather than the bleak 15% drop that many analysts had anticipated. Exports also beat expectations rising by 2.8% in the same period. The restoration of order helped calm nervous markets both in Europe and the US. Crude oil futures gained for a fourth day running with Brent crude trading up over $58 per barrel. A stronger US dollar did however subdue gains across the commodities sector. 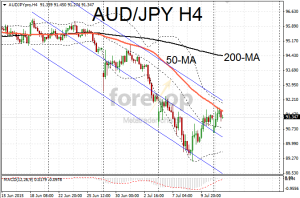 AUD/USD was finding support at 0.7402 but showing few signs of attempting an upwards break. 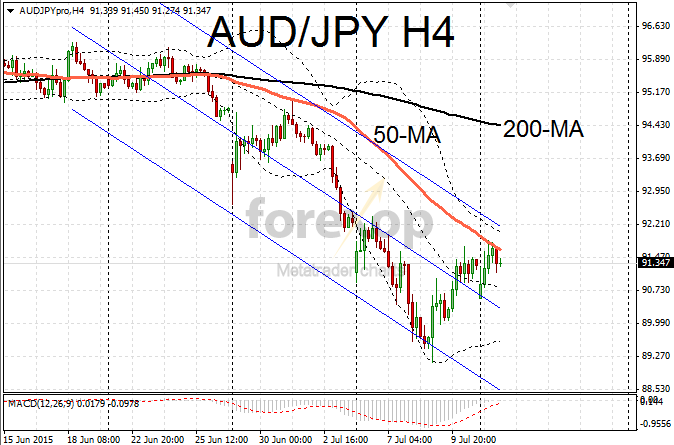 A weaker yen allowed AUD/JPY to recover to 91.32. This came after falling as low as 89.14 for the first time in more than one year. Sentiment in the yen was softer after downbeat economic data on industrial production and the service sector. Industrial production failed to rebound in May. The service sector also contracted sharply in the same period according to the latest Japanese tertiary index survey.